This is undoubtedly the best restaurant in Datai Bay area and the pride of The Datai resort to be serving authentic Malay and Indian cuisine. In symphony with Datai's theme of lush rainforest resort environment, the Gulai House too is nestled deep in the millions of years old green rainforest. 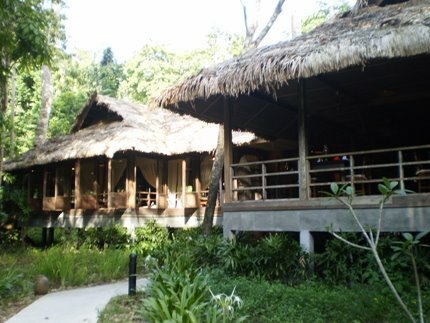 The restaurant has been built to reflect rustic traditional kampung (village) house surrounded by forests and wildlife. There wont be a minute when you can't hear the sound of creatures from the forest. If you are a resort guest, they will arrange for a battery operated cart to transfer to and from the restaurant which is located outside the main resort area. If you are coming from other locations, you will need to approach Datai bay at the far north-western corner of the island, so you need a rental car and enough time in your hand to enjoy a classy upscale dinner. From the main road of Datai, a narrow lane goes downhill (there is a signage on the main road) through the rainforest and then you take a right turn. You can then immediately see the village style elegant traditional structure. The entire structure is wooden and stands on concrete stilts. 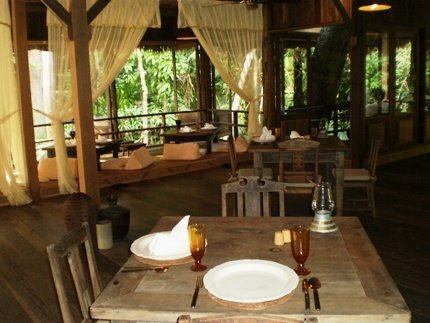 It's a large alfresco restaurant which is open from all sides with straw roof cover. The low tables and chairs with cushion are all wooden, and so are the many other decorative furnishing, some are made of wicker too. There are decorative drapes that separate the several sections in the restaurant. With rustic lights hanging from the ceiling, wicker baskets kept at the corners, decorative ceramic utensils showcased, one thing for sure, you will enjoy a wonderful rustic village theme and that too amidst lush rainforest. The waiters are all dressed in traditional Malay attire. If you had booked your table (which you should), don't be surprised when you see that your names are handwritten on a pandan leaf kept on your table. As you take your table, typically a lady waitress would approach you and offer a traditional hand washing ritual. She will bring a large ceramic jar filled with water, a bowel and rolled hand towels... you will wash your hands as she pours the water... a tradition being followed locally since ages. Now you are all set to place the order from the menu. You can try out some of the favorites here ... in starter consider 'Otak Otak' - the sampling platter of grilled fish and prawns in banana leaf, or the chicken mango salad, or the beef & chicken satay with peanut sauce, or even the soft shell crab. In main courses, there are several items to choose from. We love the Tandoori dishes (roasted in large earthen oven that are inspired by Indian cuisine)... here are some great dishes you can go for in Tandoor items... Murukh Tikka (skewered boness less chicken tikka), Ayam Tandoori (half organic chicken), Gulai Seekh Kebab (ground lamb kebab with spices), Udang Raja (king prawn), Tandoori Pilihan (platter of chicken & fish tikka, lamb and king prawn), Botti kebab (mutton morsels in spices) etc. In other grilled items some of the favorites are Daging Percik (charcoal grilled beef with percik spices), Pais Ikan Kelapa (groupers served in babana leaf with fresh coconut and local spices). If you are looking for traditional Malay dishes, try out ... Rending Daging (tenderloin beef seasoned with local spices, grated coconut etc). A signature seafood dish which they have been serving for years is Sup Ketam Berserai. Another one is ... Ikan Bakar Berulam which is grouper served with herbs and assorted vegetables. You can accompany all these dishes with fragrant steamed rice. And there are nice choice of desserts. A good one to go for is Cendol Pulut which is a traditional local sweet dish made with kidney beans, sugar, ice, coconut milk and sticky rice. The restaurant has good selection of beer, wine (can be served by glass) and even Champaign. Main courses: RM70 to RM98. You can be dressed in Resort Casual... no swim wears or above-the-knee shorts though. You can reserve a table online through the website of the resort or by calling them over phone. 6:30pm – 11:00pm. The restaurant only serves dinner. The Datai Jalan Teluk Datai | Jalan Teluk Datai, Langkawi 07000.